Wow!! It’s been almost a month since I’ve posted anything! I do believe that’s the longest I’ve ever gone and I’m sorry for that. 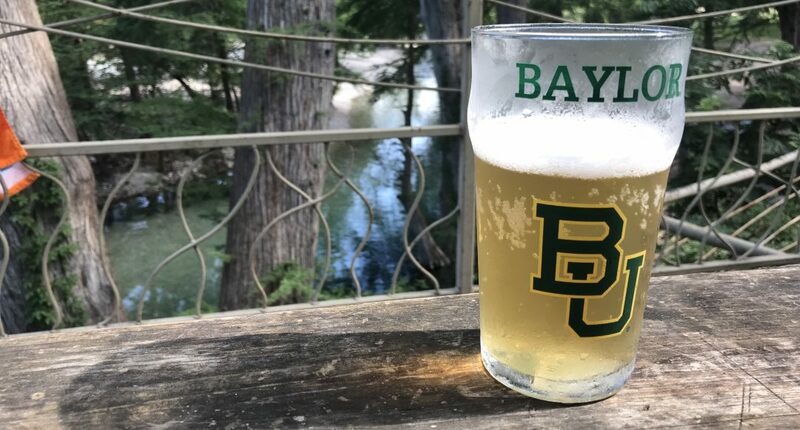 We’ve been going through some trying stuff (close family and friends will know what I’m talking about) and cooking just hasn’t been much on my mind lately. Not that we haven’t been cooking, but its been stuff like burgers or fajitas or stuff that wasn’t really blog worthy. Or stuff we’ve already done here. Been doing quite a bit more cooking inside, more than is normal for us. But we’re back!! And today we are bringing you these bundles of chicken with a crabmeat stuffing. And never fear…I’ve got about six cooks lined up that I am super excited about. So stay tuned and see what we’re cooking up. We’ve been trying to clear out the freezer a bit lately. 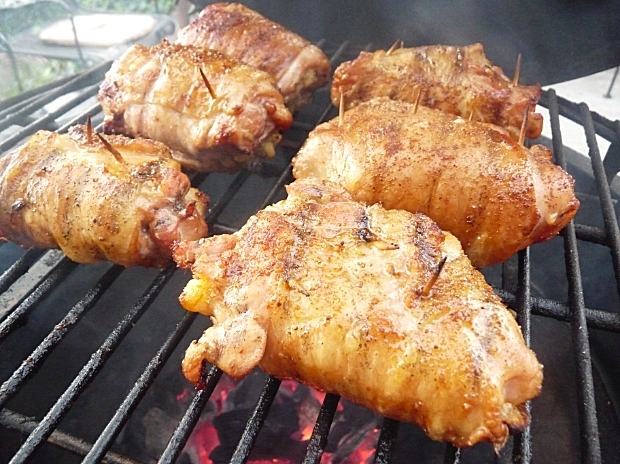 I came across these chicken thighs and I didn’t want to just throw them on the Egg with a bit of rub or sauce. No…I wanted to do something else. 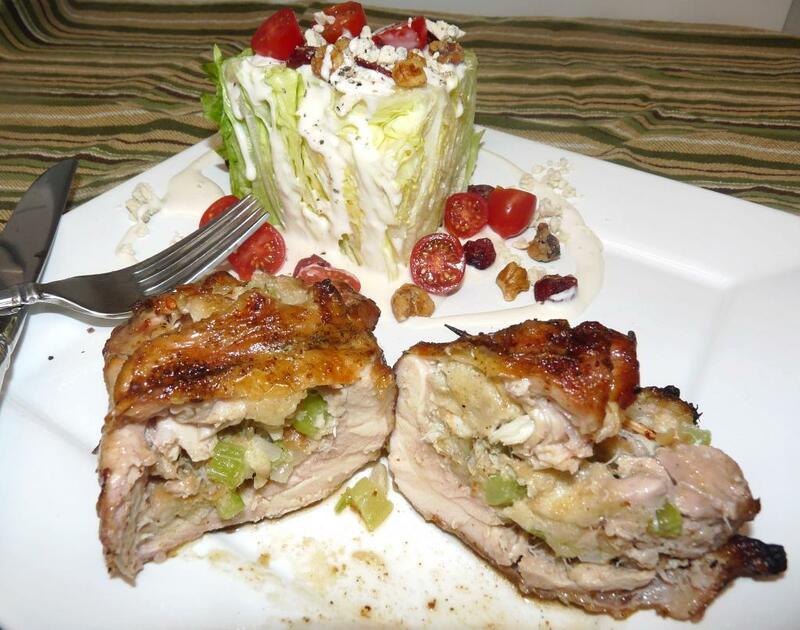 We’ve all seen stuffed chicken breasts….why not thighs? Dark meat has more flavor than white meat and is less likely to dry out. Sounds like a winner to me, so I started looking around for recipes, found one I liked and modified it a bit to fit our tastes. 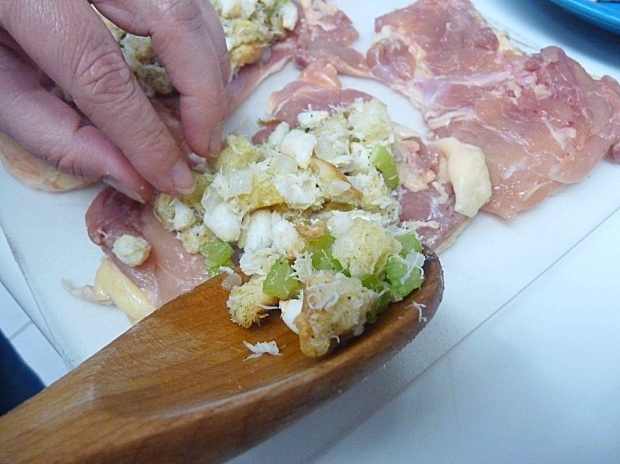 Applying the stuffing to the boneless chicken thighs. 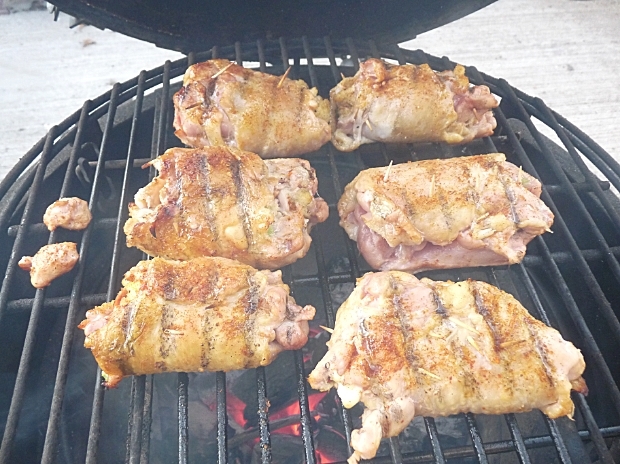 Before we get started, if you can find boneless chicken thighs, do yourself a favor and buy them. Not that its hard to debone a thigh, it’s just a pain in the but. That’s what was in the freezer though, so that’s what I used. I’m keeping my eyes out for boneless from now on. Layering the stuffing on is the easy part, wait till you get to rolling them up. Add the vegetable oil and butter to a large skillet and over medium heat. Add the celery and onion and sprinkle on a pinch of salt. Sautee until soft, about five minutes. Remove from heat and add poultry seasoning and pepper. Next, stir in crabmeat, bread cubes and wine. Allow to cool. 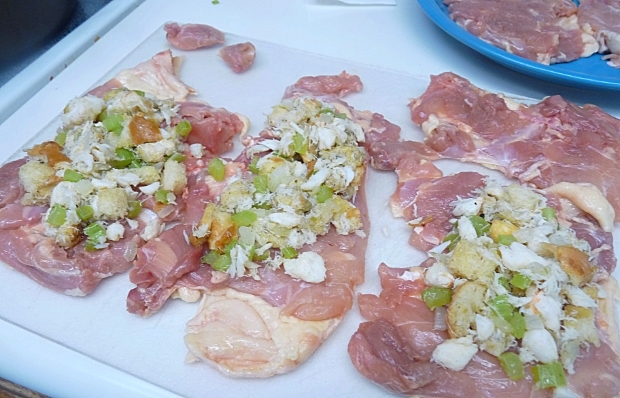 Lay the chicken out skin side down and spread an even layer of the mixture over each one. 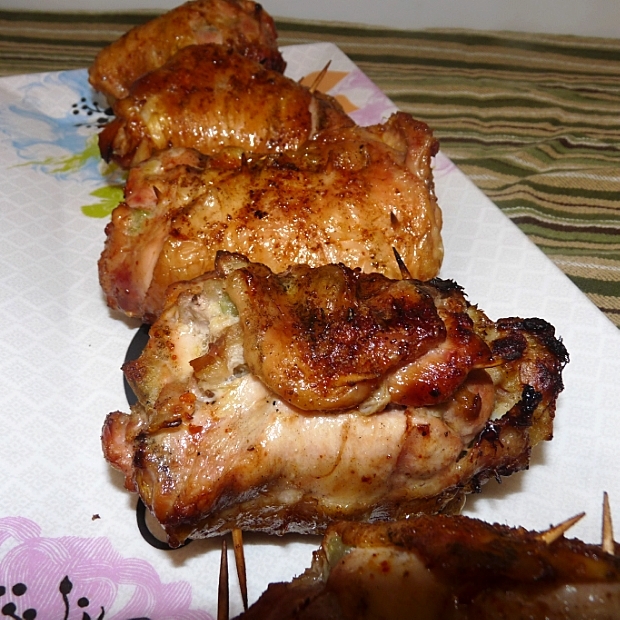 Now the tricky part….roll the chicken up and secure with toothpicks. We didn’t get any pictures of this as we had nasty chicken stuff all over our hands and didn’t want tot get it on the camera. You understand, don’t you and forgive us? I knew you would. Once you’ve got them all rolled out, season the outside with your rub and place on the grill. Cook until chicken hits about 165F. Sure, that’s high for chicken breasts, but the thighs can take that kind of heat without drying out. We’ve talked about wood and smoke before. Have you been paying attention? What kind of wood would pair well with chicken? 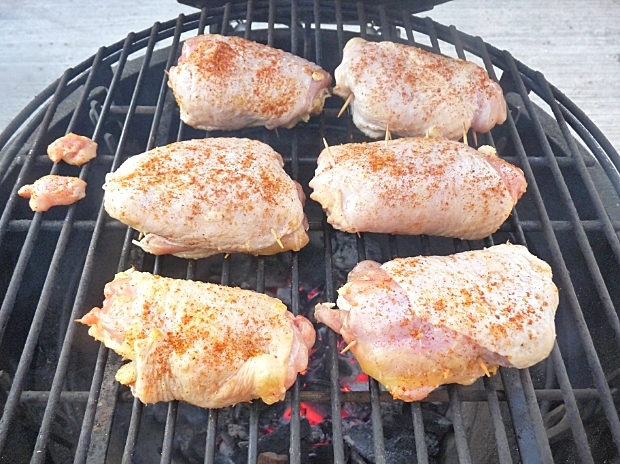 Once the chicken is done, remove it from the grill and loosely cover with foil for about 5 minutes to rest. This gives you some time to make a salad or some other side dish. 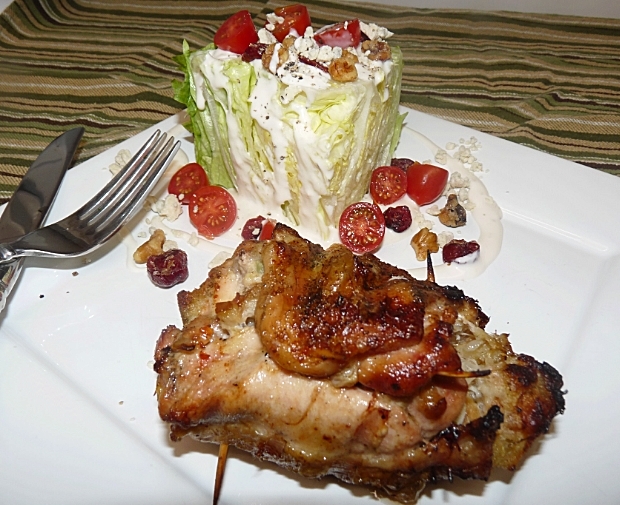 We kept it simple and just went with a wedge salad. We figured the bread crumbs in the stuffing already counted as carbs, so we didn’t need a potato or rice or couscous. The chicken turned out pretty good, if I do say so myself. Juicy, with a nice flavor from the rub and just the right amount of smoke. The first bite gave you that familiar stuffing taste with the bread and onions and celery and poultry seasoning, but then you noticed it was just a bit different from Thanksgiving stuffing. I’d really like to say that the crab meat stole the show, but in all honesty…it was kind of lost with all the other players. It didn’t jump out and you and say, “Hey!! There’s crab in here! !” Maybe fresh crab would give it that extra UMPH. I don’t know. Wow, that was art. A Mona Lisa of Meat!